You're Glendaal, and you've got a serious problem on your hands. Your hometown, Galedonia, has been pillaged and plundered by a horde of evil forces; and the citizens have been turned into deadly zombies and demons. The only way to save the town is to find your father, Shadax the Wizard, who is the only man with the magical powers strong enough to defeat Sonia the sorceress responsible for the destruction of Galedonia. To locate your father, you'll have to travel through various underworld and overworld war zones, each filled with menacing beasts beyond your wildest nightmares. You must find the hidden magical tokens that are scattered throughout the world in order to bring Sonia and her ghoulish army to justice. 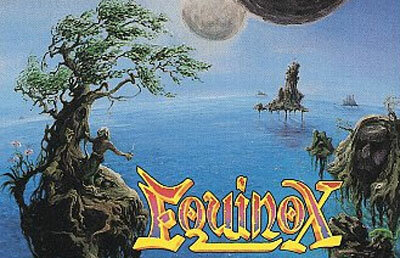 In EQUINOX, the fate of Galedonia is in your capable hands are you up to the challenge?